Microsoft Groove is an online music streaming service similar to iTunes, Pandora, Spotify and others. Its official application is available for download in every app store that you might be aware of. Microsoft had introduced Groove music as a default app to play songs and other audio files in Windows 10 operating system. The application supports offline files and it allows users to play and sync their playlist from Microsoft Groove account. Creating an online Groove account is optional. If there are no music files stored on your phone or PC, you can sign up for Groove’s 10 dollar subscription plan that allows you to listen to unlimited songs anytime and on any device. This service is available only in some countries. It allows you to listen to radio online. If you’re bored, switch on the radio and select your favorite genre. The Groove app will play the top songs for you. The Groove music software can automatically categorize the songs in albums. It features an interface through which you can easily manage the records. The interface has an option to shuffle music files. It allows users to sort the songs by their release year, artist, genre, date added and name. Groove supports the selection of individual albums so that you can add the collection of songs to the playlist, pin it to the app’s main dashboard or delete it. If you want to enjoy the songs from your favorite singer, visit the artists section of the Microsoft Groove music app. The section has the same interface as that of the album. If you have saved multiple albums from the same artist, this software will make you aware of it. Groove music allows users to create and manage a playlist. You can quickly add the entire album, or individual songs to the playlist. This software comes with a search tool to find songs, artist, albums quickly. You can find this tool under the Microsoft Groove music app’s menu bar. If you’re planning to migrate from iTunes to Groove, there’s an option to import the playlist created by the iTunes music subscription service or its official software for Windows. As Groove doesn’t find music files stored on your PC automatically, you have to add manually the folder where the files are stored. You can add multiple folders, and this is the best feature. In other music players, you have to save all your songs in a single folder so that the app could find them. There’s no such requirement in this software. The groove software can sync missing album art and song metadata automatically from the stored files. It supports two themes, dark and light. The light theme will change the color of the interface to the accent color you’ve set in personalization settings of Window 10 OS. 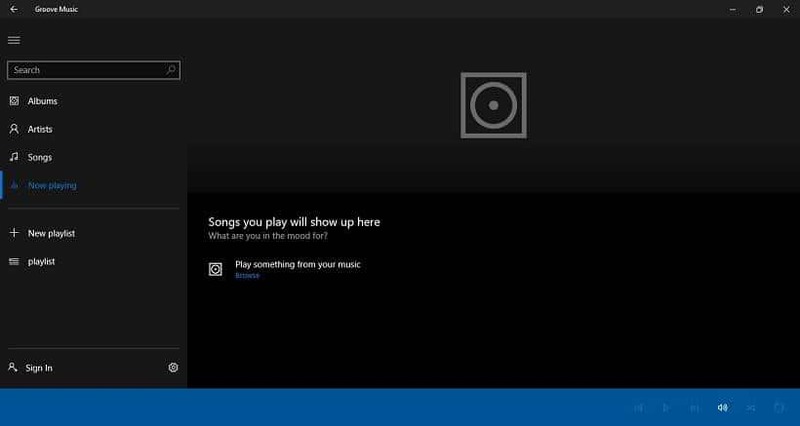 Conclusion: Groove music app for Windows 10 offers essential features. It lacks an Equalizer module. Unlike Windows music player, it cannot burn audio disks, nor it can convert mp3 to mp4 or AAC file format. Visualization feature is not supported in the Microsoft Groove app. If you want a powerful media player, install the free VLC or Winamp player on Windows. Microsoft Groove is an ordinary software to play music files on Windows 10. It has decent features that are easy to use.